American Overseas Airlines (AOA) was an airline that operated between the United States and Europe between 1945 and 1950. It was headquartered in Midtown Manhattan, New York City. American Export Airlines (AEA), commonly known as Am Ex, was founded in April 1937 as a wholly owned subsidiary of the shipping company American Export Lines. Transatlantic surveys were done with a Consolidated PBY-4 flying boat and in 1939 AEA placed an order for three Vought-Sikorsky VS-44 flying boats, dubbed 'Flying Aces', named after the parent company's Four Aces. 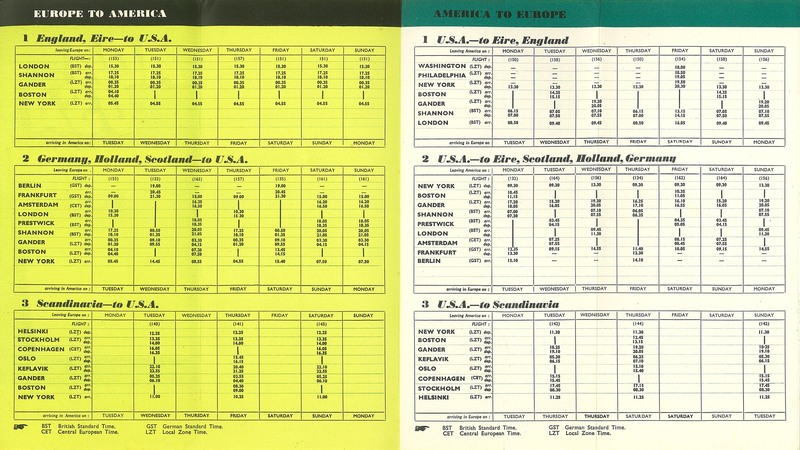 That same year, AEA made an application to the US Civil Aeronautics Board (CAB) for routes across the Atlantic from the United States to the United Kingdom, France, and Portugal. On July 15, 1940, in spite of strong protests by Juan Trippe, the president of Pan American Airways (PAA), President Franklin D. Roosevelt gave his approval to AEA for a seven-year temporary certificate to serve Lisbon (Portugal) from New York City-La Guardia Flying Boat base. Later, services were also flown to Foynes (Ireland). These services ended in 1944 when AEA started operations on behalf of the US Air Transport Command (ATC), using Douglas C-54 Skymasters mainly between the USA and military bases in North Africa. AEA could not begin its New York City (USA)–Foynes (Ireland) flying boat service before June 1942, due in part to vigorous objections from PAA. In 1945, AEA was awarded transatlantic rights, which covered destinations in Northern Europe with the requirement that the shipping company (American Export Lines) divest itself of control and turn the control over to another carrier, so that an airline was not controlled by a surface carrier. Consequently, enough stock was sold to American Airlines to give them control, but the chairman of the board of AEA, J. E. Slater, remained. American Airlines was interested in acquiring AEA since it wanted to break into the overseas market, dominated at that time by PAA. The US CAB approved the acquisition of AEA by American Airlines on July 5, 1945. The La Guardia - Botwood - Shannon route was initially operated by Vought-Sikorsky flying boats using the Marine Air Terminal at LaGuardia Airport. By 1948 the airline also served Prestwick, Amsterdam, Frankfurt, Berlin, Keflavik, Oslo, Copenhagen, Stockholm and Helsinki. The AEA name was retained until November 1945 when AEA was renamed to American Overseas Airlines. The entity started operations with six C-54's at the end of AEA's ATC contract. AOA launched international landplane flights on October 24, 1945 operating a Douglas DC-4, Flagship New England (N90904), on the route New York City (USA) to London (England UK) via Boston (USA), Gander (Newfoundland) and Shannon (Ireland). The reliable but unpressurised DC-4s were replaced on the Atlantic routes by Lockheed L-049 Constellations from 23 June 1946. From Summer 1949 the Constellations were supplemented and then largely replaced by Boeing 377 Stratocruisers, the first AOA service by the type being on 17 August that year to London Heathrow Airport. AOA was acquired by PAA but on May 17, 1950, the US CAB ruled against this merger. 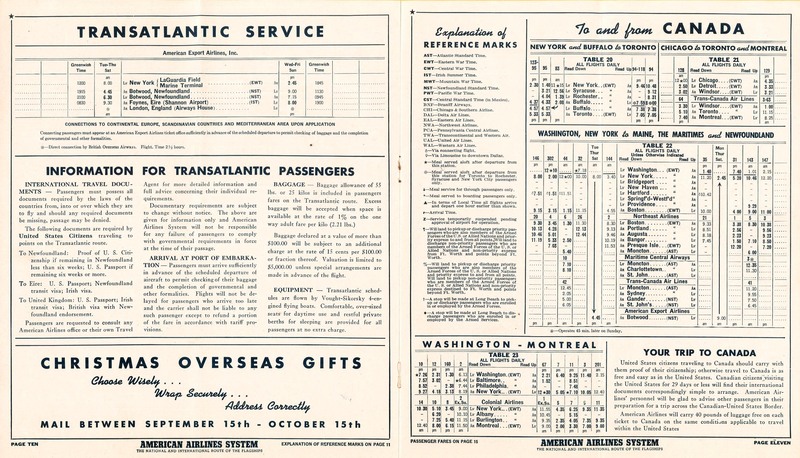 President Harry S. Truman, however, overturned the CAB decision, and AOA was merged into what would become Pan American's Atlantic Division on September 25, 1950. This unit ultimately became part of Delta Air Lines, following Pan Am's bankruptcy in 1991. 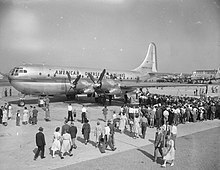 The above referenced timetable states that the airline was operating Boeing 377 Stratocruiser, Douglas DC-3, Douglas DC-4 and Lockheed L-049 Constellation prop aircraft at this time, all of which AOA referred to as "Flagships". The same AOA timetable also contains an American Airlines (AA) connecting service route map with domestic U.S flights as well as flights between the U.S. and Canada and Mexico operated by AA. On October 3, 1942, AEA's Excalibur (NC41880) crashed on take-off at Botwood (Newfoundland) when flaps were inadvertently extended to landing position, thus causing the aircraft to stall immediately after lift-off. In the crash, 5 out of the 11-strong crew and 6 out of 26 passengers perished. On October 3, 1946, AOA's Flagship New England (N90904) crashed into a steep ridge en route from Stephenville (Newfoundland) to Shannon (Ireland). This plane crash happened 7.1 miles past the departure runway. There were 8 crew and 31 passenger fatalities; no survivors. The crash investigators attributed the probable cause to "The action of the pilot in maintaining the direction of take-off toward higher terrain over which adequate clearance could not be gained." On May 3, 1947, AOA's Flagship Denmark was damaged on the runway in Boston when the right wing struck the ground because the right landing gear was retracted while the plane was on the ground. Douglas C-54 N90905 at Bromma Airport in Stockholm 1947. ^ Rice, Diana. "NEWS NOTES FROM THE FIELD OF TRAVEL; CAPE COD AIR SERVICE TOURS TO SPAIN FOR HONEYMOONERS VERMONT MUSIC CAMP CURRENCY GUIDE TRAIL RIDERS RIDE AGAIN GRISWOLD'S COUNTRY CLUB HERE AND THERE." The New York Times. Sunday April 30, 1950. Drama-Music, Fashion-Screen, Page X17. Retrieved on August 25, 2009. "American and American Overseas Airlines executive offices have moved from 100 East Forty-second Street to 100 Park Avenue"
^ See New York Times hit dated November 9, 1945 in these search results. ^ AOA used Bournemouth-Hurn airport in England until 31 May 1946 due to the non-availability of London-Heathrow airport for scheduled commercial air transport operations. The NYC-London route became AOA's most important international air link. In November 1945 AOA began through flights from Chicago, Washington, D.C. and Philadelphia to London. ^ "TRANS WORLD AIRLINES, Inc. v. CIVIL AERONAUTICS BOARD et al. ; SPARKS et al. v. CIVIL AERONAUTICS BOARD". Archived from the original on 2010-05-14. Retrieved 2008-04-28. ^ "none". Skyways: 16. July 1995. Time Magazine, November 18, 1940—"AVIATION: Pan Am v. Am Ex"
Time Magazine, December 20, 1948—"AVIATION: The Big Deal"
This page was last edited on 22 February 2019, at 19:50 (UTC).